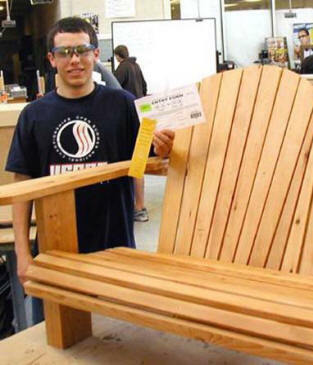 ONEKAMA � Several Onekama middle and high school students will have their projects placed in the Michigan Industry and Technology Education Society�s (MITES) state competition to be held Thursday in Battle Creek. 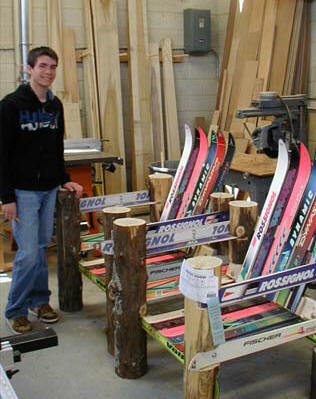 The projects were selected based on regional competition held at Pine River High School on April 30. 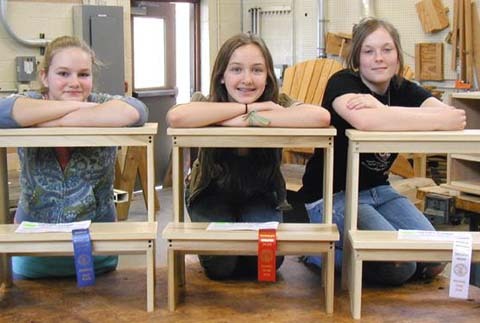 Taking first, second, and third places respectively at the regional competition were Shaker-style stools by Onekama Middle School shop students Emily Barnard, Claire Harvey and Emily Bergren. 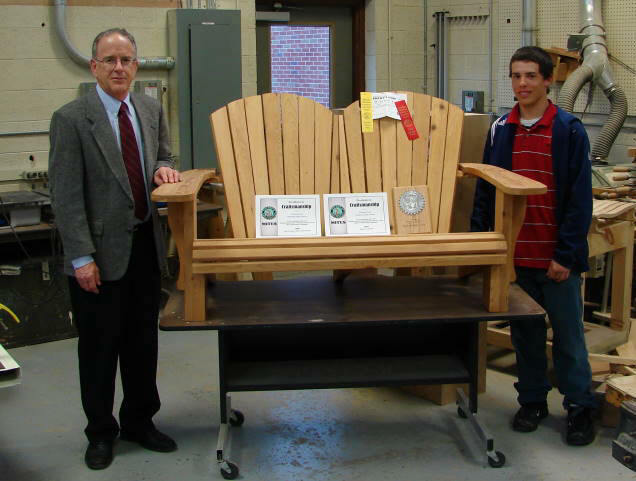 Taking fourth place in the high school wood outdoor furniture category at Pine River was junior Thomas Koon�s project, an Adirondack love seat. It will also be placed in state competition. 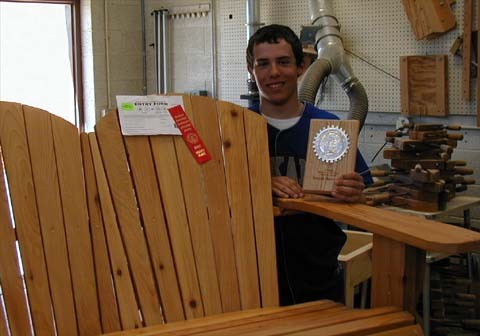 Winning honorable mention in the high school division were seniors Parker Johnson with an oak bookcase, Donny Olson with matching arm chairs made of cedar posts and downhill skis, and sophomore Duane Tiefenthal with a Shaker-style clock. The projects are made by the students with training and advice from their teacher, Paul Foster, within the limitations of one daily class periods. As the only middle/high school in Manistee County still offering a general education-level shop program, students have 50 minutes each day for classroom instruction and shop practice. Photos and text on this page by Paul Foster. 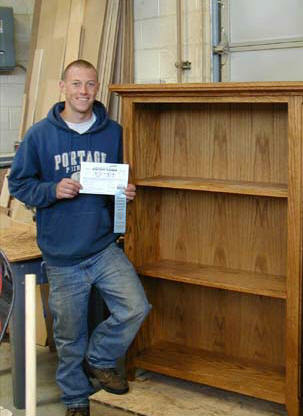 Parker Johnson with his Classic Oak Bookcase that won an Honorable Mention at the Mites Regional Student Competition. 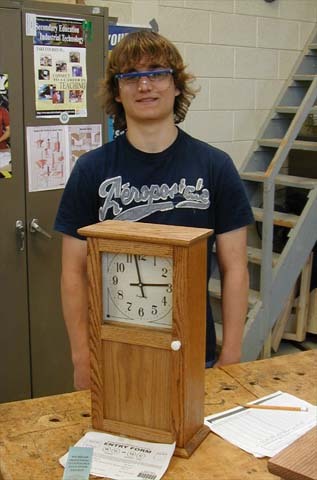 Thomas Koon took 2nd at the state competition.